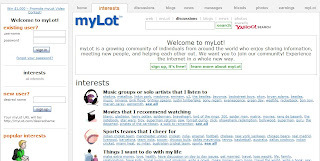 Mylot is an online community that similar My Space but much clean. After you registered you have own channel which displays your interest subjects, discussions, photos, news, and blogs. If you do not want to do anything you can just read news from different subjects that you like; if you are an online active person you have a lot of things to do. Actually, I do not like My Space, because too much stuff that you do not need, it looks mess interface if you want a few items on your channel. I think Mylot is much better. Try it, it is pretty cool. You will enjoying it I think.